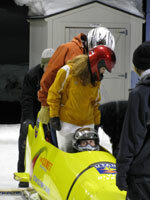 Utah hosted the Winter Olympics in 2002. You can ski by Deer Valley’s mogul and aerial ski venues, and see where the Slalom and GS races plus snowboarding events were held at Park City. Then visit the Olympic Park free of charge, tour the museum, see the huge Nordic jumps, and have you picture taken with the Torch. 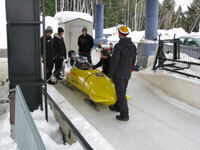 You can even ride the official bobsled track, the only full track open to the public in the world. Now for the disclaimer: I have done some “sick sports” (heli-skiing, cat skiing, sledding, para-sailing, swimming with stingrays) but the Olympic Bobsled is the craziest, wildest, fastest (and longest) minute of my life. Our bobsled orientation was loaded with warnings that this is a “severe, intense and violent ride where you will experience 5Gs”. Several times we were told, “full refunds are available, no questions asked, up until the time your sled starts down the track, but don’t ask for you money back after that.” These clues, and the iron-clad waiver, are all indications that you are about to be thrashed and compressed, akin to sliding down a frozen waterfall in a metal trash can. 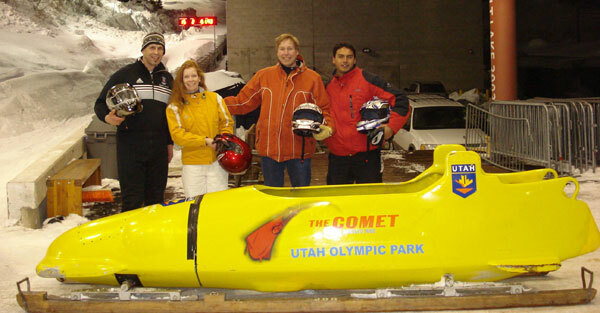 Our Olympic pilot Stephan took the driver’s seat (and the brake control – I later wished he had given it to me), and I sat behind him in the four man deathsled – sorry, I meant bobsled. We accelerated quickly down the glassy track and by Turn 6 my helmeted head was thrust into my chest with irreversible force (this was the 5Gs and 80mphs we had been warned about). The next 9 Turns I cannot account for (just a lot of praying – which I rarely do). I heard a lot of banging – which turned out to be my head against the side of the sled. Finally I felt the sweet sensation of braking and our 51 seconds of fame (just 6 seconds off Olympic gold time) was over. The neck pain and bruising on my arms however lasted several days as a memento – I also got a keepsake pin – all for $200. Amusement park ride junkies be warned – this is Universal Studio’s Hulk or Disney’s Tower of Terror multiplied by a factor of 12. This is the only full track bobsled open to untrained (read: clueless) riders in the world (no one else dares? ).